During Europe’s Middle Ages narwhal tusks were worth ten times their weight in gold—and today they can still fetch hunters more than $1,000 apiece. Narwhal numbers across the Arctic aren’t well known but the animals aren’t believed to be at risk of extinction. Nonetheless the Convention on International Trade in Endangered Species (CITES) warns that future extinction could be possible if the trade in valuable narwhal ivory isn’t closely monitored and controlled. Already, some regional populations are in serious trouble, including those along Greenland’s west coast, where narwhals are disappearing under catch limits that many marine scientists insist are far too high. Prized by medieval royalty, inspiration for unicorn myths, narwhal tusks have driven men to extremes for centuries. Today the quest for tusks and skin threatens some populations. The return of the narwhal, the tusked whale of northern polar seas, is a long-anticipated event in the Canadian Arctic. After months of darkness and temperatures as low as minus 40 degrees Fahrenheit, winter gives way to spring, and the sea ice covering Lancaster Sound begins to splinter. Open stretches of water, called leads, become travel lanes for the small whales as they follow the retreating sea ice toward their ancestral summering grounds around Baffin Island. In remote Inuit communities such as Pond Inlet and Arctic Bay, news of the narwhals’ arrival stirs hunters to reach for their rifles and head for the ice edge. Like the Inuit, I too am eagerly awaiting the return of the tusked whales. For most of June, my guide and I have camped on the frozen surface of Admiralty Inlet, waiting out blizzards and moving our tents to escape the disintegrating sea ice. When finally we hear the squeaks, squeals, and blows of these vocal whales, we climb a large block of ice and cheer their arrival. At first the narwhals parade past in pods of eight or ten, then in grand processions of hundreds. As news of their return spreads over the local field radio, Inuit hunters, many of them good friends I’ve known for years, begin arriving on snowmobiles carrying camping gear and high-powered rifles. Taking up positions along the ice edge, they watch and wait for narwhals to surface near enough to shoot with a rifle and retrieve with a grappling hook thrown by hand. The Inuit have looked forward to this moment all winter. Each man waiting on the ice hopes to land a whale with a tusk that could sell for more than a thousand dollars, a windfall in a remote region where jobs are scarce and the cost of living high. The hunters also look forward to fresh muktuk, the top layer of blubber and skin, which is prized as a traditional delicacy. But like most of life in the Arctic, hunting narwhals requires patience. The open water is wide here, and the whales stay beyond reach. So we light camp stoves, brew tea, and share stories and laughter. In the endless daylight of spring, our vigil continues around the clock. Cries of Tuugaalik! Tuugaalik!—Narwhal! Narwhal!—ring out as big males lift their tusks skyward. Then comes word over the radio that narwhals have been spotted moving up a newly formed lead 20 miles (32 kilometers) to the west. We quickly relocate and see that the crack in the ice is narrow. It’s a can’t-miss situation. Yet even at this close range, making a clean kill as the whales surface for air will be difficult. The gunfire begins in the afternoon and goes on all through the twilit night. Over the span of 12 hours 109 rifle shots ring out, but something is wrong: In the morning only nine narwhals lie dead on the ice. Surely more were hit, I think, and begin asking each hunter how he fared. This was not the first time I had heard reports of many narwhals being shot but few landed. Just weeks earlier, a man I know to be a skillful hunter confided that he had killed 14 narwhals the previous year but managed to land only one. For even the best hunters, killing and retrieving a narwhal at the ice edge is a formidable challenge, one that requires near-perfect aim and timing. The whale must be shot in the spine or brain (an organ the size of a cantaloupe) the instant it fills its lungs with air. Kill it at the wrong moment, and it will sink. Wound it, and it will swim away and possibly die later—though many narwhals apparently survive. I’ve seen more than a few bearing multiple bullet wounds. 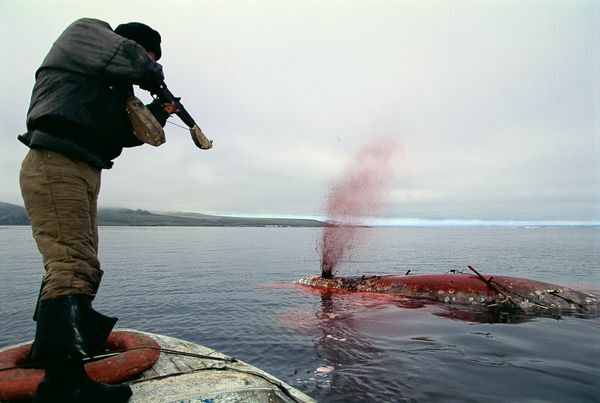 Even whales killed with a perfect shot often float beyond reach of the hunter’s hook and sink. So much ivory rests on the seafloor, said one hunter, that a salvager could make a fortune. ~ by FSVSF Admin on 13 August, 2012.